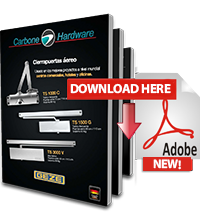 Carbone presents the Geze Overhead Door Closer Systems in Costa Rica. Used in the world’s best and top projects, malls, hotels and offices. The models are overhead pinion closers with TS 1000 C zippers, overhead door pinion closers with a slide TS 1500 G zipper, and cam pinion overhead closers of asymmetric zipper with TS 300 C slide rack.